What I have been going through these past days has no words to describe my frustration. 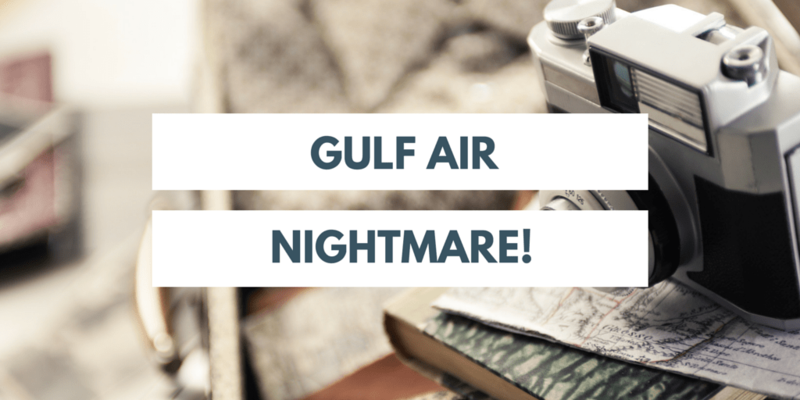 If you follow me on social media you know a little bit about my super unpleasant adventure with Gulf Air and their horrible customer service. Currently I am in Makkah to perform Umrah in the holiest month for Muslims. I had booked my flights from Abu Dhabi to Jeddah via Bahrain on Gulf Air; which I am totally regretting now, though at the time seemed like an awesome deal. The tickets where booked through Virgin Atlantic as a redemption, and for 12,000 miles in business it seemed like too good to miss. I would be able to review Gulf Air and fly business in one of THE busiest times for Jeddah airport. Extra comfort is never unwelcome especially for Umrah. The flights didn’t go as planned and currently I am stranded with no return tickets and no luggage all thanks to Gulf Air. I will be writing about it in more details but if you are planning a trip with Gulf Air think twice, thrice or maybe even a fourth time. It all started when I was in Abu Dhabi. On arrival I was informed that my flight to Bahrain was fine but my flight from Bahrain to Jeddah was not on the system and I could not fly. When I spoke with Gulf Air at the airport they were the least helpful people and said we are not listed blaming Virgin for this error. We decided to catch the flight to Bahrain and see what happens there since we had a two hour wait at Bahrain airport. Upon arrival the transfer desk were even less helpful and the airport manager as well. They said it was all Virgin’s fault that they have not listed us on the flight and we should take it up with them. We couldn’t fly in business since it was fully booked if I wanted to fly I should pay $5000 each! I was happy to even fly in economy but this was never offered to me and no attempt whatsoever to offer an alternative. The manager said we should take it up with Virgin or call the Gulf Air customer service line. They didn’t even care about fixing the problem they just cared about actually giving you an answer and removing you from their desk. They were happy to leave us stranded in Bahrain for an error they had made. I decided to call Gulf Air customer service via Skype since I didn’t want to pay roaming but she just said exactly the same thing even though I gave her the ticket numbers and everything i had from Virgin. I honestly felt like a ball being thrown at different directions with only an hour before boarding. My 45minutes of free wifi quickly finished and I had no choice but to call Virgin via roaming. I have said it before but I love Virgin’s customer service they are great and the lady I spoke on the phone really understood my frustration. Though she said the ticket on her end looks fine and they should not be doing this. I went to hand over the phone to the Gulf Air transfer desk agents who simply ignored me and kept talking to each other in Arabic. Totally frustrating and sheer arrogance. Imagine that I was actually going for Umrah which is suppose to be relaxing and a spiritual journey. Well in this instance I was nothing but relaxed and to be honest if this had happened on my return I wouldn’t mind as much but I really wanted to be in Makkah in time for my Umrah. The Virgin agent went on to speak to the Gulf Air customer service, while I was on hold. In the meantime it was only 10 minutes before boarding and the agents magically found a ticket for us in economy. Though they said we didn’t have a return flights and we should contact Virgin to sort it out. Long story short the following day I spoke with Virgin and they went on for about two hours (!) to speak with Gulf air to sort it out. I think at the end she understood my frustration since English and Arab mentality are poles apart when it comes to customer service. The tickets booked via Virgin were fine since the first leg of the trip from Abu Dhabi was OK and it was exactly the same ticket. Unfortunately their system had it coded under different reference numbers or something but if they had checked by our names they would have found the correct reservation. Not surprised they didn’t since they didn’t seem to care and just wanted to get rid of us. Customer service 0/10. The Virgin agent whom i was speaking on the phone actually re-issued the coupon which GulfAir used but they never marked it as economy but rather business. So Virgin thinks we travelled in business when in reality we travelled in economy and GulfAir made it seem like a they did us a favor by booking us in economy. Apparently now the tickets are sorted but I am dreading the moment I walk into Jeddah airport to be informed that I don’t have a ticket. Watch this space for further updates! Apparently they were oversold and decided to pretend there was a problem rather than admitting it. It would have been a lot easier to just accept the downgrade and not put us through all this. I would have been happy to fly in economy and then look at compensation for the downgrade. They lost our luggage somehow and for the past three days we are with nothing but the clothes we were wearing. We received 4 tags from Abu Dhabi though we had 2 bags, not sure why and how and we did see our bags leaving Abu Dhabi with us. I am not surprised we didn’t receive them on the airport since we only boarded 10 minutes before departure but 3 days later and no trace of them. No one of course is willing to help saying they are still looking for them and they will call us once they find them. Yah right! I won’t hold my breath. Unfortunately it is the first time I put most of my things in the checked in luggage including my computer’s charger 🙁 since we were going to perform Umrah and it was easier for my husband not to carry them. I had so many things and plans of what I wanted to do including some videos and now everything is on hold. Plus since I am in Makkah there is no place were you can buy a Mac charger. We did have to buy clothes and essentials to get by but it has been 3 days already. P.S. I would love some advice on how to go on with regards to claiming from Gulf Air and how to get them to compensate me not so much for the items but rather for the emotional and psychological frustration. I don’t even think this article can describe how bad it was. P.P.S I just called Gulf Air to re-confirm my flights and they are saying my flight from Jeddah is not available and Virgin should have waited. I guess the saga continues. 🙁 Now I have to wait 24hrs to see if they will confirm seats for us. Sorry for your ordeal. i have had similar happen to me, though not at such a busy travel time, sometimes tickets do not connect properly when an airline books an award ticket on another airline, for a while UA tickets on Asiana were a mess and I was give.a transPacific flighr that did not ticket. In that case UA had their own flight later that day and created an award seat opening and transferred my ticket over.. I learned then to always check award tickets have fully fone through and to periodically check back on them. Best of luck. Actually I forgot to mention I called 2 times Gulf air to check the tickets and once Virgin and both said it was OK. It is crazy how airlines can treat passengers. I’m sure if it was a Virgin route they would have opened availability. I was flying from Abu Dhabi to Delhi trough Bahrain with Gulf Air and I had to fight over an hour to get checked in. Because they never had heard from Visa-on-arrival. They don’t let you fly if they are not sure that you can get in to country. So they demanded visa even there was visa-on-arrival opportunity for India. What had visa-on-arrival to do with your getting checked in by Gulf air? Indeed a very bad experience but why would you chose this time for Umrah which makes things so complicated. I thought I had a tough time with Etihad during fog days in late December where virtually every flight was delayed and no one was able to connect at Abu Dhabi, but after reading your story, I think I did a good job. I’m very sorry to hear of your difficult situation with Gulf Air. After an award ticket is ticketed, I normally check the operating carrier’s website online to see whether I can pick my seat and see that all flights are there. I do this all the time whenever I use UA Mileageplus to redeem on star alliance carriers, where some airlines use different ticketing systems and thus have different record locators/reference numbers. I’ve flown Gulf air 3 times on the LHR-BAH route and never had a problem but then again, my flight was at less than 50% capacity. On an A330, a lot of people had their own row so I have nothing to complain about. If your return flight is oversold as well, I’d go to Jeddah airport as early as possible if I were you. Good luck and I hope you get your luggage soon! I am so sorry to learn of your “nightmare” with Gulf Air, Elena. I did not experience the severity of problems when I was a passenger on that airline recently. My only advice to you is to salvage your Umrah by concentrating on the relaxation and spirituality which you are supposed to experience — difficult as it may be for you. Right now, that is far more important than what has happened to you with Gulf Air; and it is the main reason why you are on that trip in the first place. Deal with the issue when it is time to do so. The last thing you want to do is have your Umrah ruined and then have it further exacerbated by what appears to be the inept and uncaring employees of Gulf Air treating you with unacceptable customer service. Brian I do try to enjoy my Umrah. Virgin confirmed my ticket 2 days ago. Today I decided to double check with Gulf Air, guess what my ticket is still NOT confirmed and they are saying it’s cancelled and I have no seat!! …and I thought my Gulf Air flights not being credited yet to my American Airlines AAdvantage account was a problem. I look forward to your updates and hope the situation is resolved in your favor — and I also hope that you are compensated accordingly for all of the angst which you have experienced. By hook or by crook, you better get Zalk to Dubai. We’ve got things planned! I just read your second post on your gulf air debacle, and I was wondering what happened in the end regarding compensation to you after all of this? for the trouble and having to seat economy on a business ticket. Where Virgin & Gulf air apologetic etc?